The annual Process & Packaging Machinery Association (PPMA) show at the NEC, Birmingham, this week was surprisingly good for Advanced Labelling Systems, with new customer enquiries up nearly 20%, over 2008. Although at first it looked like the exhibition, which appeared to occupy less hall space than in any other year previously, was heading to be a flop, we need not have worried when the doors opened on Tuesday and the visitors entered in their droves. Showing a broad cross-section of our labelling machinery from the ever popular semi-automatic labellers, through to our high-speed primary product label applicators, print & apply, product handling, barcode scanning and auto-ID systems, right up to pallet labellers, we were able to demonstrate that ALS can provide any type of labelling machine. The PPMA Show, which last year celebrated its 21st birthday, is a notable machinery event in the UK calendar and has always attracted a good caliber of visitor, such as Project Engineers, Production Managers and other such professional people who like to compare the typical build quality of machines that each company produces, which is why I believe that ALS always gets such a good response from the visitors to our stands. Our stainless-steel constructed “3-roller” can orientation labeller generated much interest, as did our newly developed “M.O.B.I.” barcode system (Multi-media Omni-directional Barcode Identification) created primarily for logistics labelling of CDs, DVDs, Video Games and Books where the item barcode needs to be scanned on the opposite side to which the price promotion label needs printed and applied. 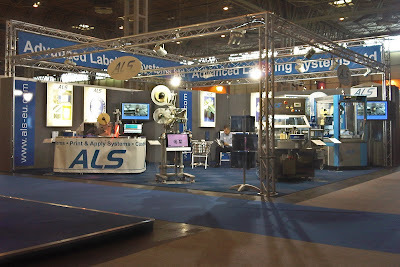 The good feeling of optimism was felt by the other exhibitors that I spoke to, some of whom are also ALS customers that integrate our labelling equipment into their own special purpose machinery. All in all, it was three days well spent, afterwhich I have come away feeling a lot more optimistic for the recovery of the UK manufacturing industry as a whole and that as a country, we have definately turned a corner. Thank you to everyone that came on to talk to us about their labelling requirements and to all our customers that stopped by to say hello. However, if you didn’t get a chance to talk to us, please drop us a line and we will be happy to arrange a meeting! And finally… Much thanks to the whole ALS team, who made a tremendous effort to make this year’s show such a success – well done everyone!